The NPR program From the Top is recording tonight in Corson Auditorium. Damon Gupton will conduct student ensembles during the show. Actor and conductor Damon Gupton stopped by IPR earlier today for some conversation in Studio A. He's an artist with a successful career embracing two disciplines, each of which is typically all-consuming. You can hear and see From the Top in Corson Auditorium tonight at 7:30 p.m. 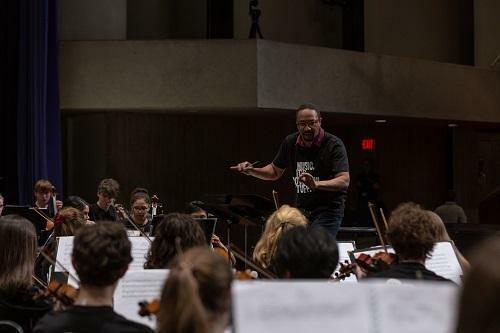 The concert features Damon Gupton along with pianist Michelle Cann and students from Interlochen Arts Academy. Go to tickets.interlochen.org. The program will also be a featured webcast at live.interlochen.org. We had one rehearsal. We had about 30 minutes to do our work. It’s been fast and furious but good. I mean, the level of the level of talent [at Interlochen] is extraordinary. So it's very humbling and inspiring. We divided into separate sections and interviewed one another and reported what we learned about the other person. There were some really, really good questions and thoughtful responses from the students. 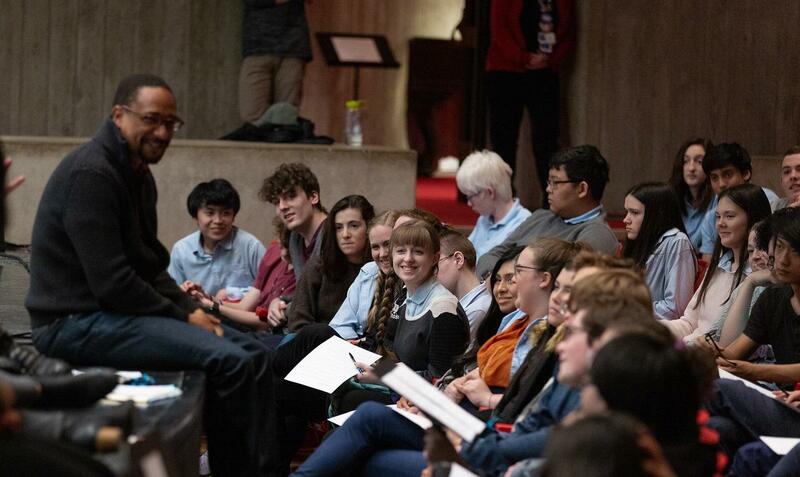 You get to see the personalities coming out – you know, they’ll wail on a bass trombone solo or something and then all of a sudden they get in a group and they're just quiet and reserved and learning to express themselves in another way. The number of students separated from their families, who are from other countries - particularly some students from Peru and Venezuela that I met - they haven't seen their folks in a while. You learn a lot more about the humanity of being a young artist as well. I think I became obsessed with music when my mother walked in the door with the soundtrack to the film Superman in 1978. I don't know if I knew that that's where I was headed completely at the time, but something really, really grabbed me about those sounds. I became obsessed with John Williams scores and picked up an instrument. The Olympic fanfare and Star Wars, come on, for a low brass player, it’s heaven. I'm doing one [Williams score] next week in Fort Worth. I'm conducting my first live film score with orchestra, and it's Jurassic Park, so I'm just a kid in a candy store. I'm still being pressured by outside forces to choose – you could take my theatrical representatives on one side or you could take Leonard Slatkin on the other side (who was a teacher of mine). But I don't I don't know how to choose. I am choosing, in a way, and I'm choosing to do both. That comes with its limitations and certainly has its drawbacks. But there's so much that I'm able to do and express that a lot of people aren't, and I think it's personal for me. And when you're able to come and have an experience like this [taping of From the Top] where you actually get to host and interact and use a sense of theatricality, and then just so happen to do Swan Lake - I mean, it’s like heaven to me, being able to juggle and balance. It’s not for everybody, but it is for me. I'm just happy to be in some of the fortunate position that I've been able to be in. I’m a big Tchaikovsky fan. From the time I was these kids’ age, I just fell in love with all those big tone poems – Francesca da Rimini and of course Romeo and Juliet. The Tempest might be my favorite one of them. The Fourth Symphony, Fifth Symphony, and Sixth Symphony - you know what they say - they’re like the Star Wars movies: three of them are good and the rest [laughs]. But I like the first three, too. Big Russian Romantic rep kind of dude, you know. Not to mention some Duke Ellington orchestra stuff and Mahler [sighs]. I had a big Mahler phase when we were in school together at Michigan* - big, romantic, angsty stuff. I highly encourage youth - and everyone of multiple interests and talents - to become multi-hyphenates and explore. There's so much out here now at our fingertips, and the word “artist” can be rather broad. I think people have more interests now, and they have more accessibility to things now. I think they should tap as much of that as they possibly can. They want to play triangle and in the back of the section, but they have a jazz quintet too. And they may not even be majoring in jazz. Or one young woman said, “You know what? I'm interested in Sophocles.” Yeah. Good. Go do some Sophocles! A broader palette is highly encourageable. 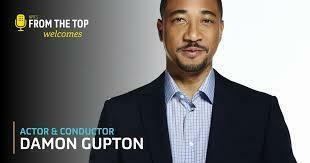 *Damon Gupton and IPR’s Nancy Deneen were in the same class in the School of Music at the University of Michigan.